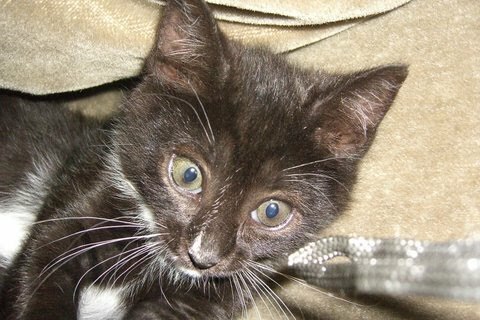 In May 2007, on impulse, and totally out-of-the-blue, I drove to my local shelter and adopted a six week old kitten. I had not "owned" a cat for over thirty years, but had always lived in a home filled with dogs. One week later, my father had a massive stroke and went into a coma. Over the next several weeks, as my father lay dying, I devoted a bit of time at the end of each day to socializing this little fur ball we named Natasha. Each evening, when I arrived home from the hospital, I was greeted by soft purrs and joyful head butting. This tiniest of kittens would not let me forget that, no matter how bleak and hopeless life seems, there is always a place for comfort and joy. Then, months later, while I was still grieving over my dad's death, my love for the little kitten led me to the Cats Stone Ledge. Although Natasha is the cat that owns me, I have come to view her as ‘every cat.’ She is the hungry and homeless kitten that shows up on a suburban house deck on a blustery night in November. She is the queen carrying her litter to safety, and the Tom who crosses the driveway, limping with fresh battle wounds. She is the cat you always wanted but could not have because your brother was allergic, or your landlord said, ‘sorry, no pets allowed.’ Natasha is one of the untouchables that lives in alley ways from New York to L.A. She is the barn cat nestled between straw bales. Natasha is your best friend and has slept at the foot of your bed every night for fifteen years. She’s a mouser and a midnight carouser. She is a dumpster diva. Natasha comes when you call to her. She almost never listens. Natasha is a nest of kittens purring somewhere in the darkness.